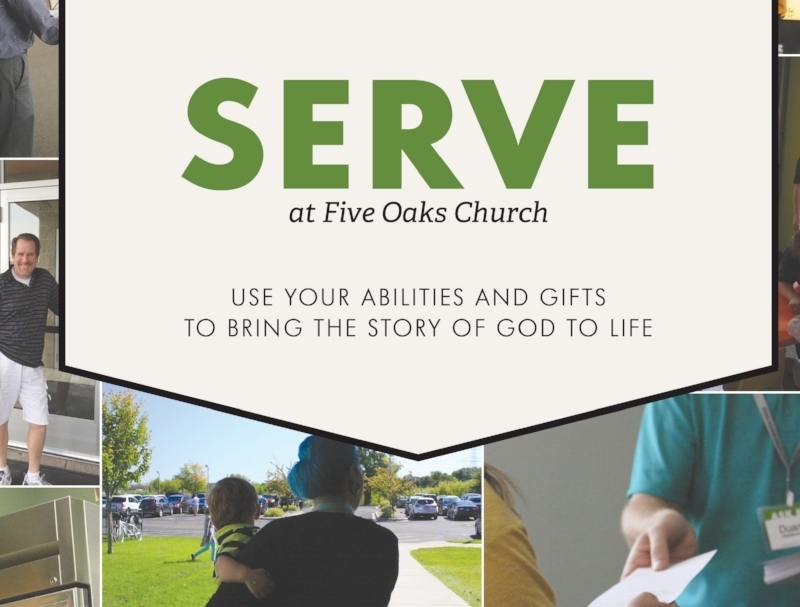 This weekend at Five Oaks you will receive a SERVE brochure with your Worship Guide. You may fill that out and drop it in the offering box on your way out of the Worship Center. Or you may email Jennifer Clemens, our Serve Coordinator, at jclemens@fiveoakschurch.org. She will contact you and walk you through the process to begin serving at Five Oaks. Take a break from your hectic schedule and usher in your weekend with a time of worship and fellowship, led by our worship band at Five Oaks. This is a timely opportunity to share the evening with your small group, neighbors, or other friends — a great way to fellowship. Acorn Cafe will be open for drinks. See you at 7:30 tonight (Friday, November 11)! Childcare not provided. Our Five Oaks musicians compiled another great CD of original music, called Glory & Praise. It will be released November 12/13 at church. Because these songs represent a picture of our heart to God, we hope you’ll take one for yourself and take one to give away, perhaps to a friend you’d like to invite to church. The cost: free. We’ll also have a free download of the music available the same weekend. Women’s Ministry is organizing a household items drive for the Dwelling Place, a home for women and children of domestic abuse. The Dwelling Place needs cleaning supplies and other household items. Please pick up the list of needs at the Women’s Ministry Cart; all donated items are due to Five Oaks by November 30. The Union Gospel Mission Thanksgiving bag drive is upon us! This year our goal is 550 bags! Grab a shopping list at the Impact Ministry Cart. Take your family shopping and use this list to buy the ingredients to help a family in need have a warm Thanksgiving meal. Use any bag for shopping this year. Please return filled bags to Five Oaks by November 13. Students: Rev up for the UGM Thanksgiving Bag Drive! Student Ministries will partner with Five Oaks and the Union Gospel Mission to provide Thanksgiving dinners, through donations of food and finances, to local families in need. Our goal is to fill 75 bags as part of Five Oaks’ bigger goal of 550 bags. Students, please bring allfood or financial donations on or before Wednesday, November 16. Shopping lists are available at the Impact Ministry Cart this weekend. Christmas decorating help needed this weekend! Help us transform the Commons and Worship Center of Five Oaks for the Advent season. We need 20-25 volunteers to help decorate our church for Christmas. Consider inviting your small group to serve together in decorating! We’ll have some seasonal treats to boot. Sunday, November 13, 1 pm till we finish. Please email Harold Ennulat, hennulat@fiveoakschurch.org, if you are interested in helping. Have you adopted children into your family? Have you ever done foster care or Safe Families? Are you considering adoption, foster care or Safe Families for your family's future? If you answered yes to any of these questions, please join Five Oaks Orphan branch as we commemorate Orphan Sunday, Nov 13, room 105, 10:30 — 11:30 am. Refreshments will be served. Members, we need your voice and your vote. Members and regular attenders, this is your chance to learn about the ministry year and learn what’s ahead for the next ministry year. Join us for a brief meeting, starting at 4 pm with worship. Childcare available during the meeting. Dinner to be served after the meeting — your children are welcome! If you or a family member have special dietary needs, please email Carole at carolelehn@gmail.com by November 15. We will be voting on a by-law change at the Congregational Meeting on November 20 at 4 pm. This by-law change can be read on the Five Oaks website at fiveoaks.church/governing-board-elders. Copies of it are also available at the Information Center (formerly Guest Services). Odds are, it’s in the Lost and Found at the Info Center. Our Lost and Found is brimming with items such as sweatshirts, kids’ Bibles, earbuds, sunglasses…the list goes on. Please stop by and claim what is yours. All unclaimed items will be donated November 27. Hey kids, grades 1-5, join us at Five Oaks on December 2, 6:30 — 8 pm, for a night of Christmas fun! Live music, cookie decorating a hot cocoa bar, and other fun activities await! Parents, please sigh up your students with Rhiannon at rrutledge@fiveoakschurch.org. Parents, mark your calendar for another Christmas Parent Workshop presented by Tree House Children’s Ministry. This workshop will be full of ideas on how to make the most of your time with family during the Christmas season. Please join us during either the 9:15 or 11 am service on December 4. Room 101. No need to RSVP; we’ll see you there! Crossroads Church’s Woodbury Campus is hosting a free Surviving the Holidays GriefShare Seminar on Sunday, November 13, 12:45 p.m.— 2:45 p.m. This community event is open to all who are grieving a loved one’s death. Participants will receive comfort and encouragement through a video presentation and small group discussion that explores how to deal with emotions, what to do about traditions, tips for surviving social events, and how to find hope for the future. They will also take home a helpful Holiday Survival Guide. Registration is now open at www.crossroadschurch.cc/share. For questions, please contact Lisa Renlund, Campus Care Pastor at 651-294-7745. Recommended participant age is 16 years and older. Crossroads Church’s Woodbury Campus is located at 5900 Woodbury Drive, Woodbury, MN 55129. Want to make a difference from the comfort of your own home? Invite a Japanese college student studying at Bethel University this winter (February 18th - March 14th) to be a part of your family! Share your love and faith with your student, and you'll plant a seed. Your student takes classes during the day and spends the evenings with you. Transportation help to/from Bethel is provided as well as a stipend. For information contact Lisa Bekemeyer, lbekemeyer@me.com or 651-253-9498.